A study led by Louise Rose, PhD, RN, FAAN, of the University of Toronto Bloomberg Faculty of Nursing, is seeking people who have experienced delirium and their family members to take part in a study. The study is titled “Development of core outcome sets for effectiveness trials of interventions to prevent and/or treat delirium” (Del-COrS) and the goal is to help develop an international consensus on a set of core outcome measures to be used in delirium trials. In this part of the study, people and family members of those who have experienced delirium would be asked to participate in an interview about their experiences with delirium and what types of outcomes are important to them as delirium survivors. 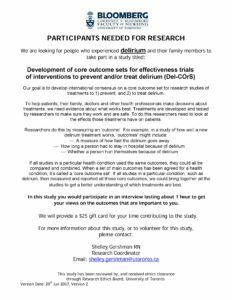 Anyone interested in learning more about the study or who would like to volunteer can contact the study coordinator Shelley Gershman, RN, by email at shelley.gershman@utoronto.ca. The study protocol was published in a 2017 paper in BMJ Open and is available open-access online.